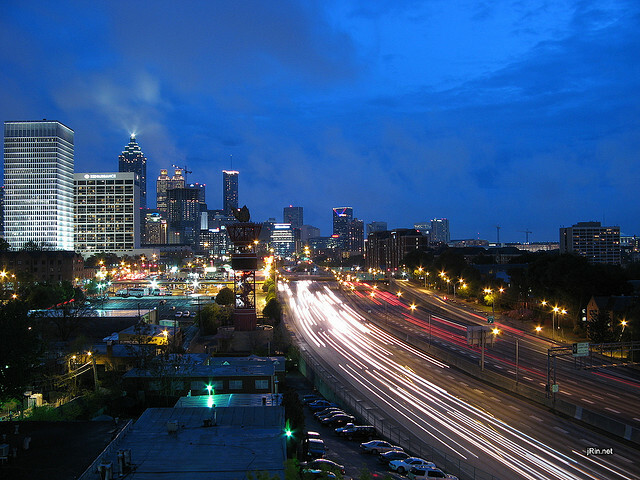 Atlanta, Ga. was ranked the lowest among 100 metropolitan areas for transit coverage, with a rate of 68.5 percent. Photo by James Rintamaki. A new report from the Brookings Institution shows transit systems in Atlanta, Dallas and Houston do the poorest job of reaching households without cars. The report, “Transit Access and Zero-Vehicle Households,” identifies disadvantaged groups and calls on policymakers to improve transportation choices to improve quality of life. According to the report, 700,000 American households struggle with getting to work and to stores because they cannot reach local transit systems. The report is the first in a series of three studies following the release of “Missed Opportunity: Transit and Jobs in Metropolitan America,” which highlighted the disconnect between transit options and low-income families. Looking at the 100 largest metropolitan regions in the United States, the report provides rankings for lowest and highest transit coverage rates for no-car households. Atlanta, Ga.; Dallas and Houston, Texas; Phoenix, Ariz.; and St. Louis, Mo. had the lowest coverage rates for no-car households with coverage rates of 82.2 percent and lower. Los Angeles and San Francisco, Calif.; New York, N.Y.; Seattle, Wash.; and Miami, Fla. had the highest coverage for no-car households, all with coverage rates of 97 percent and higher. A total of 7.5 million households do not have access to a car but can travel by transit. Most of these households, 61 percent, live in cities and most– 60 percent–are low-income. New York, Chicago, and Los Angeles have the highest number of households which do not own cars. While 90 percent of these households can travel around their metro areas by transit, on average they can reach only 40 percent of jobs via transit within 90 minutes. Households without cars in cities have much higher access to transit; 99 percent live near transit. Only 58 percent of households without cars in the suburbs live near transit. The report highlights three growing needs for metropolitan areas. The first is the importance of transit agencies to continue to address coverage gaps and route changes that reflect job and housing growth in suburban areas. Second, the report shows the need for land-use planners to concentrate development in denser locations, avoiding sprawl. Third, the report acknowledges the obligation of local policymakers to recognize the reality of transit problems and take realistic measures to meet the needs of transit riders. To complement the study findings and the rankings, the Metropolitan Policy Program also released two interactive maps that look at transit data from more than 100 metropolitan areas. The first map shows the number of households without private vehicles in relation to other metropolitan areas and the second map shows the number of zero-vehicle households without transit coverage. Access the maps here. Streetcars Made in the U.S.A.